Completely rebuilt in 2017, Mountain Shadow’s legacy of luxury lives on in Scottsdale, AZ resorts through its bold, modern designs, breathtaking views from private patios and amenities and services offered to their guests. 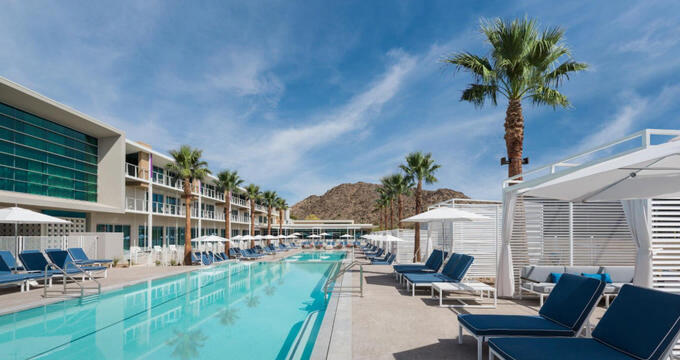 Originally built at the foot of the Camelback Mountain in 1959, Mountain Shadows continues to be known for its historic presence in Paradise Valley, where vacationers flock each year for spectacular desert views, peaceful surroundings, and self-renewal. The Signature Guestroom – These rooms include one king-size bed, or two queen-size beds and it is approximately 427sf. The layout of the Signature Guestroom is open and spacious, with a bold, geometric design. The Premium Guestroom includes a 95sf private patio, perfect for guests to step out on and breath in the warm, desert air. The Garden Guestroom – These rooms are approximately 427sf and includes one king-size bed. This Guestroom includes a 130sf terrace with a floor to ceiling glass opening for guests to awe at the iconic views of Paradise Valley. The Mountain Guestroom – The scenic Mountain Guestroom style cabins are about 436sf and has a direct view of the historic Camelback Mountain. This Guestroom includes a king-size bed and a floor to ceiling glass opening revealing a 95sf private patio with seating, perfect for spending the evenings reading or relaxing, with the beautiful desert scenery in the background. The Cabana Guestroom – This cabin is unique for its oversized private 160sf patio. This guestroom has a view of the pool at The Citizens Club. 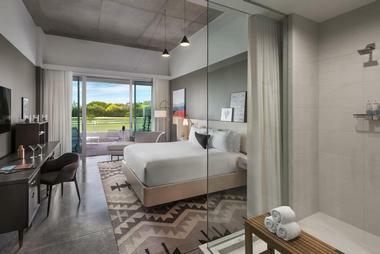 The cabana is 427sf in size and reflects a neutral, modern design, like many of the other guestrooms. Guests choosing to stay in these rooms have direct pool access from their private cabana patio. The Immerse Guestroom - As its name implies, the rooms allow the guests to indulge themselves in the many amenities that are designed for guests to immerse themselves in, to truly experience the luxury of a top-rated mountain resort. Guests often enjoy the luxurious soaking bathtub, which is separate from the main bathroom. 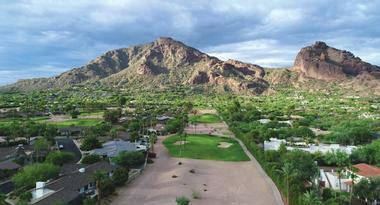 While rejuvenating in the water, visitors can look out the large windows at the Camelback Mountain. With 464sf and a 62sf balcony, guests will have many opportunities for enjoying the warm Arizona weather and basking in the Arizona sun. Many of the services and amenities provided to the guestrooms are similar. Some of these amenities and services may include a cocktail cart with recipes, built-in workspace, plush robes, and slippers, 24-hour room services, private bar with snacks and drinks, hair dryer, iron, and ironing board and laptop-sized safe. Additional amenities include luxurious bedding, red flower bath products, Fitness Center access, in-room coffee and bottled water, unlimited wireless internet, 55” flat screen HD television and custom furnishings and lighting. The Camelback Presidential Suite – This suite is known for being the most luxurious lodging option available at Mountain Shadows. The voluminous 633sf interior patio faces the Camelback Mountain directly and allows guests to take full advantage of watching the glorious desert’s sunrise and sunset. The views are just as beautiful for guests from the separate, additional bedroom patio. With 1,123sf of living space, this suite provides guests with the perfect balance of indoors and outdoors. For guests wanting a more spacious room configuration with multiple bathrooms, beds and bedrooms, Mountain Shadows provides luxury resort residences with more limited availability. By upgrading their stay, guests will have added, bonus amenities including an in-unit washer/dryer, full kitchens, and roomy outdoor spaces. The luxury resort residences include king-size, queen-size, studios, lofts, and a penthouse. All luxury residences include custom furnishing and modern décor. Mountain Shadows restaurant, Hearth ’61, commemorates the date of May 24, 1961, when Paradise Valley officially became an incorporated town. This remembrance is celebrated in the spirit of fine dining, good eats, and communal gathering. Whether dining on a rich roast served from the stone oven or savory seafood platters with flavored vegetables, the smoky dishes at Hearth ’61 make a long-lasting impression on guests. Diners without a heart appetite can choose to sip craft cocktails, local beers, and wines, along with smaller, snack plates with big bursts of Southwestern flare. 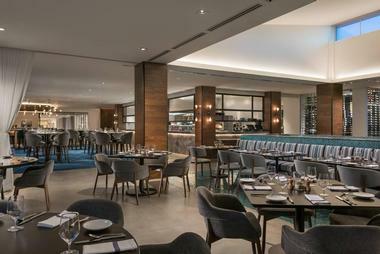 Open for breakfast, lunch and dinner, transparent glass walls allow guests to dine with a gorgeous, desert backdrop. Rusty’s Grill & Lounge is oftentimes full of famished golfers. The lounge was named for Rusty Lyon, the father of Scott Lyon. Scott was the developer who headed the reconstruction of the newly reconstructed Mountain Shadows. Rusty Lyon was a golfer and long time commercial real estate icon in Paradise Valley. Rusty’s is open and ready with breakfast and hot coffee for all the early morning risers. It also accommodates golfers and guests alike, serving lunch items and hosting a happy hour in the afternoon. Dining area and seating include an indoor, chic lounging area and outdoor, shaded patio. Mountain Shadows offers “The Short Course”, a quick round, par-3, 18-hole course. Most recently named “Renovation of the Year” by Golf, Inc. the sleek, modern design of The Short Course has earned national recognition and attention. The original course was designed and built by Arthur Jack Snyder in 1961 and quickly became famous amongst Hollywood celebrities for its lush desert scenery and mountainous landscape. Forrest Richardson, whose mentor was Snyder, designed the new course. The updated course reflects the original one with its challenging holes, rough slopes, and familiar Camelback Mountain views. Guests who want to schedule a tee time can do so on-line or by phone. Mountain Shadows has two 75-foot pools available for the comfort and relaxation of its guests. The two pools are connected by a modern waterfall and are heated throughout the cooler, winter months. Guests may also choose to take a dip in the hot tub, while admiring the Camelback Mountain and taking in the warm Arizona sun. Cabanas can provide guests with a more private, shaded pool experience. All cabanas are conveniently located near the 75-foot pools and include comfortable lounge seating, a television and food and drink service.